Seeking the essence of coastal luxury beach home living just steps from the sugary white sands of the beach? 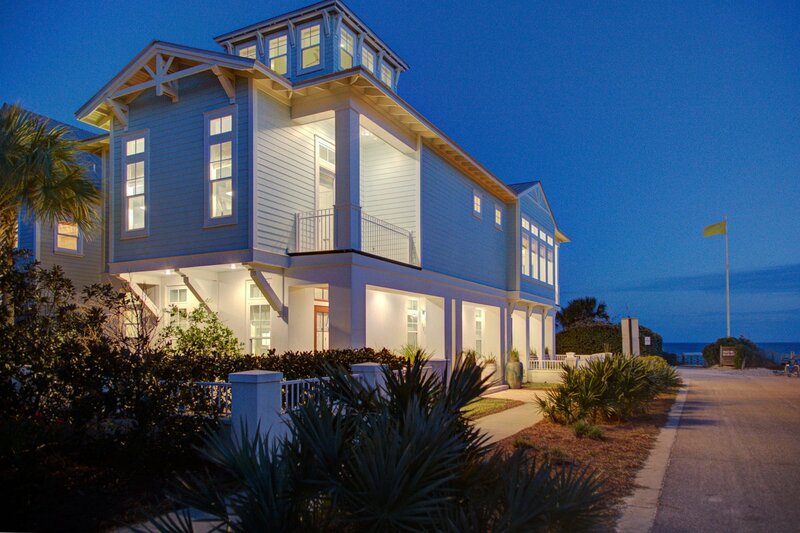 Then 185 Winston Lane, located at the upscale eastern end of 30A in Inlet Beach, is your address destination. This 3,978 plus sq. ft. elegant open airy home sits one tier off the beach with beautiful unobstructed western views of the Gulf in Inlet Beach, immediately adjacent to Rosemary Beach, close to boutiques, cafe's, restaurants, and local community events, neighborhood community pool, and about 45 steps from the front door to the beach. Current owners tended to every detail for their beach home which they had custom built in 2013 by local premier contractor, J. Becker Custom Homes. This 4 BR/5.5 BA with large bunkroom home is comprised of 3 stories with elevator access, and staircase access to the enclosed 4th floor observation tower with built in window seats perfect for stargazing or seeking a cozy retreat. Construction features include solid mahogany exterior doors, Jeld-Wen high impact glass doors and windows, metal roof, and concrete (CMU block) on first floor, and HardiePlank second floor and up. The home is equipped with a 35 KW whole house Generac generator, two tankless Rinnai Water Heaters, surround sound, security system, and smart home technology. Professional interior design and architectural features embellishes each floor of this home, with custom cabinetry, wire brushed white oak wood floors in living areas and bedrooms, travertine and tile flooring in bathrooms and laundry room, beautiful natural stone finishes, custom hardware, artwork, and comfortable furnishings and accessories. The first floor is comprised of a master suite, master bath with large soaking tub and full walk in shower, and two guests bedrooms with private full baths, large laundry room, and storage room. Double doors lead to outdoor patios, a side garden and a fenced in area for your pets. Second floor encompasses large gourmet kitchen with two large islands-one with breakfast bar, a walk in hidden pantry, solid wood-100% custom designed, custom built, and custom finished cabinets, large Sub-Zero side-by-side refrigerator/freezer, ice maker, wine cooler, 8-gas-burner Viking cook top with mounted pot filler, proofing oven, convection oven, built in microwave and large oven. The kitchen is open to the large living and dining area overlooking the Gulf. Large windows with transom windows let in plenty of light. A double-sided gas fireplace separates the dining and living area. Double doors lead to the outdoor 2nd floor balcony overlooking the gulf with outdoor gas fireplace, which is wonderful for those cool beach nights. Outdoor cabinets are custom built from reclaimed deadhead cypress. Second floor master bedroom hosts' a balcony off to the side, full master bath with soaking tub and walk in shower, and double vanity. The third floor consists of a large bunkroom with the capacity to sleep six. Bunkroom has two double bunks, and two twin bunks. The media room/sitting area has double doors, which lead to the third floor balcony. The fourth floor consists of the enclosed observation tower. Among the exterior features are outdoor shower, storage area for beach toys, fenced in back yard for your pets, garden area, corner lot, and parking with custom pavers to accommodate vehicles. If you are seeking a beach home for a permanent residence, or the perfect beach retreat as a second home or vacation rental, then 185 Winston Lane is the desired address. This home has been used as second home and has never been rented. All dimensions are to be verified by Buyer(s).